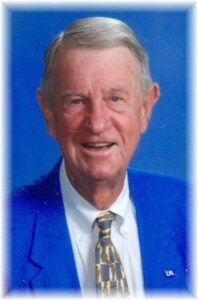 Dale Barnstable, 93, died at his home in Louisville January 26. He grew up in Antioch, IL, and after graduation was drafted by The US Army. His unit marched across Germany, France and liberated a concentration camp in Austria. When WW II ended, he moved to KY where he lettered in basketball at the University of Kentucky and his team won two NCAA titles , the beginning of the UK tradition. Coach Rupp invited him to play in the Olympic Games in London, England. Next he coached Manual HS to second place in the sweet 16, and was named High School Coach of the Year by the C/J. He was inducted into the Halls of Fame for Antioch HS, Northern Illinois Sports, and Manual HS. He was a founding member of Hurstbourne Country Club and the Kentucky State Senior Golf Association. Dale retired from American Air Air Filter and continued his love of amateur golf by playing on the US Senior Challenge. He won two KY senior titles, Match Play and the Senior Open, then became the first Kentucky senior amateur to qualify and play in the Senior British Open at Royal Portrush, Ireland. Dale was predeceased by his step son Chas Henne. He is survived by his wife Jerri, his daughters Pricilla, Patricia (Brown) and Barbara (Ray Edelman), son Dale Jr, stepdaughter Sherre Henne, 4 grandchildren and two precious great grandaughters. A celebration of life will be held June 1st at Hurstbourne Christian Church. Expressions of sympathy can be made to the church, Hosparus Louisville, and the Barnstable Brown Diabetes Research Center at U of K.
Add your memories to the guest book of Dale Barnstable. To the Barnstable siblings, so sorry to hear of the loss of your dad. My dad, Jack O’Neil worked with your dad at AAF many years ago. I remember my sister and I coming to your house with my parents. Sorry this response is late. Your family is in my thoughts and prayers. With sadness I read of your Father's death and offer my condolences as you grieve his passing and the void left in the lives of your Mother, brother and you three sisters. Having lived a full long life with the love of his family and pride in their success will help each of you to bear the heartbreak of grief and loss. I hope you may take comfort in each other with the support given by friends.